Before you buy, please read our dimension chart carefully. Normally, the size of a sofa cover should be slightly larger than that of a sofa. 1. The sofa cover uses comfortable fabrics, which is soft to touch. 3. Uses the sofa cover to decorate home. 4. Protect your Sofa from stains and spills, from kids and pets, and add an elegant loook with this beautiful slipcovers. 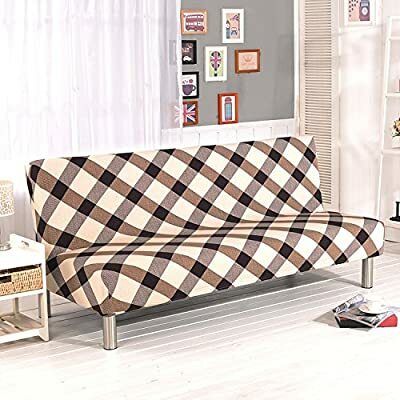 Soft & Elastic Material: 92% polyester fiber + 8% spandex Applicable size: Sofa length 180-210 cm/ 70.87-82.68 inch; Sofa width: 55-65 cm/ 21.65-25.59 inch; Backrest height: 55-65 cm/ 21.65-25.59 inch; Sofa cushion thickness: 20-30 cm/ 7.87-11.81 inch The product adopts environmental protection reactive dye making process. It has bright patterns, soft fabric, 360 degree all-cover stretch band design. The cover won't shift easily, and is convenient to wash and detach, offering you perfect enjoyment Exquisite Workmanship: The five locking stitches are delicately made to protect borders, so that you don't need to worry about unfastened stitches, unraveled stitches, and other problems Machine washable and dry quickly!